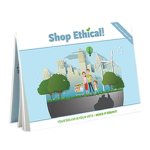 How we shop | Shop Ethical! 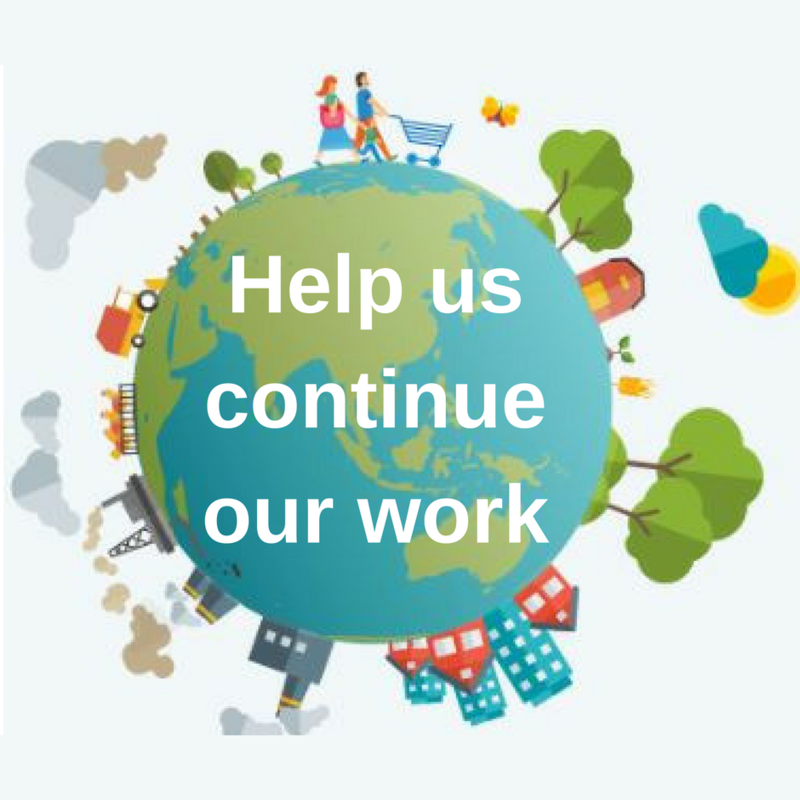 Part of what we, the Ethical Consumer Group, do is help people work through the difficulties of trying to make better choices in their shopping practice where there are limited options and a minefield of different issues to consider. With this in mind I thought it may be useful to give some personal stories about how we, the people working on the project, do our daily shopping. Hopefully it gives an insight into the issues that come up and some possible alternatives. We are a household of four – Janet, Nick and two kids – Talitha and Charlie. We’ve been thinking about this stuff for some time so discovered some good options along the way that work for us. I’m in no way saying that these option will work for you, or are in fact ones you may chose, this is just an example of our attempt to put theory into practice and to see our best intentions and ideals come to fruition. Often people refer to the guide as if it were a bible – all the things within sacred. 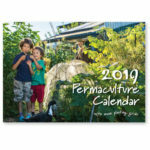 In fact as the name suggests, it is just a “guide” – a starting place in becoming informed about the issues connected to our products and in making better choices. One of our key principles in ‘shopping with a conscience’ is making trade offs – knowing that most products won’t meet all the criteria that you might value and you need to prioritise what is most important. In our family of course all the issues play a role and we’re looking for find ‘best buys’ that meet many criteria. However for me, the issue at the top of the tree is ‘waste‘. We are particular about reducing packaging and specifically avoiding plastic packaging wherever possible. So we’re lucky that over time we’ve discovered and created some routines and systems that mean some of the dilemmas we’d face going to the supermarket for everyday essentials are no longer issues. I am continually reminded that although there are better buys within the supermarket, the real answers are beyond the present systems of industrial food production. In conventional systems we’re often faced with a lack of basic information – where its grown, how far its traveled, what its sprayed with and how its processed. Below are some of the answers that we have found that have helped us on the journey towards reclaiming control over where our food comes from and knowing what its story is. First and foremost we get our Fruit and Veg via a local community cooperative box system – The WOC – which stands for Western Organic Collective. This co-op was set up in 2001 by a group of people in the western suburbs who wanted to have access to cheaper organic produce, and be more connected with the processes behind our food. We receive a $20 box of assorted fruit and vegetables each week on the doorstep. We don’t get to choose the produce – it’s decided by the two people rostered on market run each week – who try to get the cheapest, but also a good range of produce. We reckon we would pay about $50 to buy this at a regular organic retail shop, so it’s a ‘good deal’. Our box makes up about 80% of our fruit and veg needs. Other veg is supplied from our own home garden – not much but its a start – mostly greens – lettuce, silverbeet, bok choy, brocollic (at this time of year), herbs, peas, pumpkins and hopefully we’ll have some carrots ready shortly. The summer before last we had a decent crop of beans and corn. So we suppliment this with a trip to the Footscray market each week. We buy conventional produce (so you might say we’re not ‘organic purists’) but I try to have a conversation each week as to where it comes from with the shop staff. These are most often cauiflower, carrots, bananas and other fruit. On this weekly trip I go to the local deli to pick up bread and cheese. I found a shop some years ago at the Footscray market that sold Andrew sourdough bread. It’s 85% rye bread so works for our family who are somewhat gluten intolerant. And, it’s baked in Laverton (ph:9931 0187). Melbourne. We bring our own bags. We also bring our own containers for cheese – which was a great discovery as plastic cheese wrap was one of the major contributors to our landfill waste each week. We were shocked to hear our amazing deli was to shut down after 20 years in business last June. Luckly they passed on the bread to another local deli and we still get mozella and chedda and sometimes ricotta (without packaging) there. Part of the WOC system is a dry goods day every three months, where we order things such as flours, rice, grains, sugar, dried fruit, nuts, honey, oil. We then meet together on a Saturday morning to weigh and sort the orders from the larger bulk supplies. It’s a fun social event with lots of home cooked goodies and catch up time on news and local happenings. Once again it involves us bringing our own containers and so avoiding excess packaging. It also allows us to know where our items are from. There’s a bunch of things that we don’t get through the dry goods day, and have found we can get them from Friends of the Earth food coop (FOE) in Smith Street in Collingwood. Items here are stored in bulk and we bring our own containers to fill up, there’s a systems to weighting the containers first and then the items after but it works very smoothly. We get the following items here: tea, spices, pulses, pasta (including gluten free), breakfast cereals, tahini, peanut butter, shampoo, dishwashing detergent, and sometimes soy milk. We have a local food coop Grasslands here in footscray and they have great items available but not quite the variety of FOE. It’s incredible the amount of things you can get – almost all of the regular supermarket fair, but here it’s sourced locally, or is organic, or fairtrade or something similar. We try to get to FOE once a fortnight but its often less frequently as it involves a car trip. It has been done with the bike and paniers but this only works without the kids, who are usually around on the days I can go. Another great food coop resource close to us is the one at Melbourne University. See more on food coops and resources for buying in bulk at our Zero Waste Challenge pages. We get our tea and coffee via People for Fairtrade, a group who wholesale fairtrade food items. Someone in our WOC coop network takes and places orders once a month. This is one of those tradeoffs for us. Ordering this way means we end up with some packaging, however it is significantly less expensive than buying from the fairtrade shops close to us which are:-Green Collective store, Plump organic grocery (both in Yarraville) or FOE food coop. Fairtrade drinking chocolate we get from the Oxfam shop in the city, when I’m passing through. 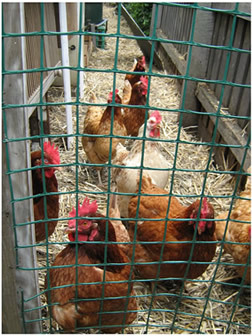 We have chickens for eggs – six now after two recent deaths – but these girls have been off the lay for some time. So the reality is that we get our eggs from an egg stall at the Footscray market. Considering animal welfare, we choose ‘Free Range’ (usually Misty Mountain from the Yarra Valley or Sunrise from Bendigo) and would choose free range or barn laid with a certification (such as FREPA or RSPCA) but these aren’t available at the market. See article in previous newsletter regarding egg choices. So what’s left to buy at the supermarket? Well, we actually try to avoid using the supermarket where possible, especially the big two. Coles and Woolworths have a huge monopoly on grocery in Australia. We avoided Woolworths after the CEO, Michael Luscombe, in response to the ‘Select’ homebrand greenwash scandle in 2007, said “It’s about perception and reality and clearly consumers can sometimes make decisions on perceptions. So it’s important for us to be seen to be doing the right thing.” (details). No accepting of responsibility, no apology for misleading the public, no acknowledgement that consumers deserve transparency instead of spin. The rest of the family are big dairy drinkers and eaters. I’m often asked which milk we buy. I would like to say an ‘Australian owned’ Milk (such as Devondale or A2) but we actually buy Pura (owned by National Foods and Kirin Holding who don’t have a great track record in the guide). We choose to buy it because it is what is available from the corner store across the road from our home. We like to support Susan, the owner, and her local business with whom we now have a relationship. In time we’ll suggest she stocks some Australian owned alternatives. We also sometimes buy our cornflakes from here when we run out of FOE cornflakes. We choose Kelloggs even though they have a boycott call in the guide as we consider it to be somewhat different from the boycott call on a company like Nestle. Nestles is the largest global food company in the world and they have a huge amount of power in addition to being crticised for over 30 years. We have a no-Nestle policy. When we do go to the supermarket, we go to the local independent supermarket SIMS in West Footscray. It’s usually for butter, toothpaste (I have purchased chemical free toothpaste such as Baby Organics or Grants from Plump organic grocery, and I also make my own), sometimes yoghurt (although we often make our own), sanitary products for Janet. She chooses De Jour which is made by a local Australian woman. However it is packaged in 3 layers of plastic. She also sometimes uses Carefree in bulk, which has less packaging. Other things we buy or think are worth mentioning include nappies, shaving razors, toilet paper, meat, pet food, stock and tinned fish. Details are below. Nappies. We use cloth nappies. (Compared to disposable, cloth nappies save not only energy in manufacture, and waste and chemicals to landfill, but also about $3,000 over 3 years). When we had Talitha we used ‘flats’ – terri toweling nappies – that we folded, but since having Charlie we’ve used Baby Beehind fitted cloth nappies. These are are still washable but manufactured with press-studs to make it easier to use. They’re designed here but made in China or Vietnam. We now also use Eenee flushable biodegradable nappy liners. These are made from plant-based celuslose material and will break down when flushed. They get washed and reused if not poo soiled. They were available from NECO but now Green Collective Store in Yarravile. More recently we have bought compostable nappies for Charlie at night – they ‘re only used at times when Charlie has a bad bottom rash or when we’re camping. They are called ‘Nature Babycare ECO nappies’ and are made from cornstarch (GE free) and designed to breakdown down in our compost system. I have to slice them open and slice off the (non-biodegradable) plastic tabs on the sides. We consider managing this waste in this way is better and safer than disposing of faeces nappies in the regular rubbish bin which is commonly done. These compostable nappies have some significant travel kilometers attached. They come from Sweden where Naty, the company, is based, but are actually manufactured in Israel. Razors. I was excited to find my father had an old stainless steel ‘double edge ‘ Wilkinson safety razor. I went into the local tobacco shop in Footscray and found I could buy a pack of 10 blades for $1. They’re made in Germany, but come in a cardboard box with thin plastic wrap around outside. Previously I’d only seen refills of brands such as Wilkinson or Astra in a hard plastic box costing $9-$16. So packaging and cost wise – this is not a bad option. For travel miles its rough, and I’m mindful they are still ‘diposable’ – ie.we’re throwing out the blade. One day I might gravitate to a ‘cut throat‘, depending on my steady hand. Toilet paper. As anyone who have come to our workshops knows I rave on about SAFE toilet paper – 100% post consumer waste recycled content (it’s been out amongst us as copy paper then collected and made into this new product). It’s also paper wrapped, non-chlorine bleached and manufactured in Laverton – not far from where we live in Footscray. We get it at Green Collective store or sometimes at SIMS local supermarket. Meat. I avoid meat where possible, but Janet and the kids get chicken, mince, chops and sausages from a free-range butcher in Blackburn. We’re keen to avoid factory farmed meat in the interest of animal welfare. The chicken is also in conversion to Organic (which makes it somewhat cheaper than full organic). We only get out there about once every 3 months, on the way to visiting the grandparents, but we’ve recenly invested in a second hand freezer that means for the relatively small amount of meat consumed, we have enough between trips. Cat food. The irony comes when you see what the cat eats! Many moons ago we used to feed the cat tinned food and have experimented with different alternatives in order to reduce packaging waste (tins). We also try to avoid what is ‘junk food’ for our cat so we tried vegan cat food. I used to get discardied fish heads from the market in my own bucket which I’d cook up in an outside microwave on the back porch then cool to feed the cats. Not too popular with the family regarding backyard smells, but great in terms of using waste without waste. We then used to get discrarded bones from the local butcher for free but they insisted on putting them in a plastic bag which was not really going to work for us. So now we actually buy mince (regular mince) from the Footcray market, bringing our own bags. We then divide it up at home into serve potions using segments of milk cartons to freeze it in. Of course we’d prefer if it was non-factory farmed but we’d be paying quite a lot for it if this was the case and so it’s a trade-off we’re making at this time. Cruelty free food for us, but not for the cats! Still looking for best alternatives. Chicken stock. In a similar way, we get chicken carcasses ($1) each from the local market chicken shop and cook them up for stock, which is the basis for soups. We also get cat food meat from these. These are factory farmed too, but in terms of resource use it is positive – these girls get used once before us and twice by us. Finally – we’ve avoided tinned fish since seeing the movie ‘End of the Line‘ and realising that our oceans are very much overfished. We have occassionally got Whiting or Flathead from the local market as a treat, as these are more sustainable alternatives according to ACMS. Janet is excited as she’s been looking to get fresh sardines from the market and see what she can do with them and some roast cauiflower! Of course this is our story (our family) as opposed to an offical view. Our journey is far from perfect, sustainable, or ethical, but these are goals that we’re working towards. Our methology is simple – small steps, in the right direction, each building on the last. It’s worth mentioning that at times we do find ourselves shopping in ways very different to what we would choose. Sometimes specific circumstances mean we’re pushed and we fall short of the ideals. Just recently I found myself out of action due to a slipped disk in my back, and so in celebrating Charlie’s second birthday, we got a bunch of dips and crackers, all with a lot of plastic packaging, something we’d usually avoid. Yet the intention is that these occasions are very much the exception to the norm. I encourage you to take up the challenge of negotiating through the minefield of issues connected with our everyday products. It does take time and initative to try to make your purchases line up with what you value and lighten your impact where possible. But, once you’ve done the work it becomes easier and hopefully your discoveries can make it easier for someone else. All of this is hard work if we do it alone. I’m hoping that our story has been useful to you. Of course the story of how you shop is just as important and so if you’d like to share it, please post it up in the ‘User Comments’ section below. We shop once a month at the Collingwood Children’s Farm farmer’s market. Every week, we shop for vegetables at Organic Wholefoods in Lygon Street and staples at Naturally on High. Some items we buy at Piedemonte’s IGA in North Fitzroy. I’m mostly interested in organics and reducing packaging. My partner’s key issues are food miles and the environment. Together we end up with a wonderful range of fresh and seasonal produce and some delicacies that have been preserved the old-fashioned way. We mostly buy the same brands and products but if we need a new item for a recipe, we check our Ethical Guide before we make a decision. The real challenge is that I’m gluten and dairy-intolerant so we have to make some compromises and pay more than we’d like for some items because the more ethical ones taste awful. My favourite biscuits, for example, are made in a country I’d prefer to boycott.